There’s a big push on #patientdata at the moment. This includes some very valid criticisms of the leaflet and the way it has been delivered. The inevitable spoiler campaign. Not to mention the usual misinformation being reported and repeated without challenge. Some of the news articles I have read leave you with the impression that sharing data is an entirely new activity across health and social care. It is not. What is changing is the way this is managed; for the better in my opinion. Yet I am torn. There is that part of me cheering the fact that our health service is making a concerted effort to engage people about data after years and years of dragging its feet. Thank goodness we have begun to share the data dilemma, and everyone’s role in tackling it. Then there is the communications professional in me that can tell you – without a shadow of doubt – that direct marketing and national newspaper campaigns are blunt instruments that rarely result in public understanding. Unless repeated. Unless part of a bigger and more varied campaign. Unless pursued over the longer-term. I read somewhere that the recall rate for national newspaper ads is something like 1 in 5 people and lots of variables drive how high or low that figure is. I fear I sound churlish but my point is a simple one. But we are going to have to work harder at this if we want the noise disturbance to subside into something more harmonious. And that includes supporting regular conversations with patients and carers in those settings where the importance of sharing their data will feel immediate and personal rather than distant and impersonal. As well as reminders at key points in their life. My son just got a birthday card from our local football team – why can’t the NHS contact people when they reach the age of consent to tell them why the NHS is there, what it offers and their responsibility to it? In the meantime you may find this piece by Dr Geraint ‘Big Data’ Lewis at NHS England helpful. As well as this excellent graphic from Cancer Research UK about the benefits of sharing data from a research perspective. 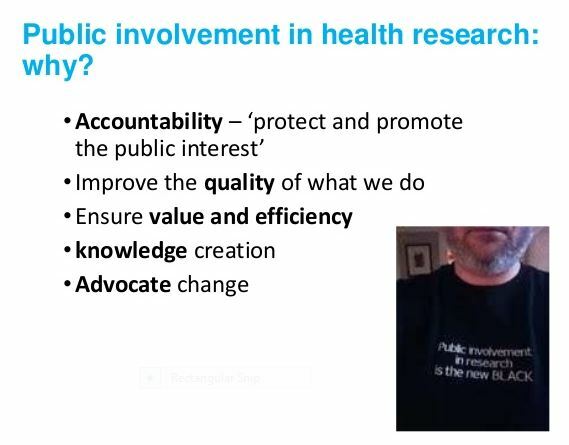 I must say, despite CRUK being a monolithic organisation, I am feeling more positive by the day about how it is thinking about public involvement and engagement. The moral case for public involvement in research is dead, long live the moral case…..
‘I was so angry when I found out how much money was being spent on Multiple Sclerosis research but how little patients and carers had been asked about how it should be spent,’ said my friend and colleague. She was talking about the spark that lead to her own personal history of involvement in research. I mention this because, at the moment, I quite often begin my talks and presentations with ‘why’ we do this thing called public involvement. You can see the latest version of this presentation which I gave in Canada last week here. The five ‘whys’ I focus on are in the picture below. I often talk about how these ‘whys’ are in the ascendant for many organisations now – over and above the moral case which perhaps dominated before. But my friend’s comment is a timely reminder that morality is alive and well in this debate. Thank goodness. In fact, for most of us, isn’t it the hand that pushes us away from the shore to begin our public involvement voyage? Is UK health research ready for localism?